Directions: At the U.S. 36 and 8th Street stop light, travel north approximately 1 mile. At the T in the road, turn left. Follow the road about 1/2 mile, which ends at the Trail Head. Hours: The trail is open sun up to sun down. 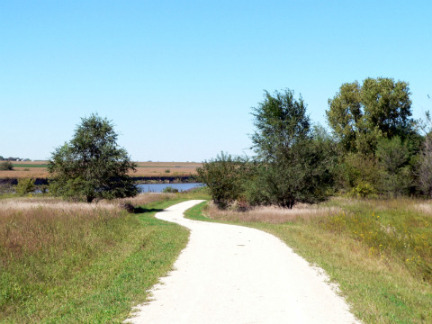 Winding through wooded areas, a canyon with 20 ft. walls of limestone, grassland vistas and fields of corn and soybeans, the Blue River Rail Trail offers views of the river, wildlife sightings and the music of songbirds. The 7.2-mile stretch is built on the former right-of-way of the Union Pacific Railroad with a surface of crushed limestone screenings. 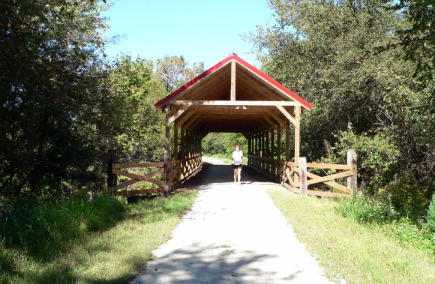 Several bridges, a preserved railroad bridge, a 150 ft. bridge offering scenic views, and a small covered bridge adorn the trail that continues on to the Deer Trail Road Trail Head. 1.5 miles from Deer Trail Road to Oketo is open with an unfinished surface. Past that point, the trail is still under development, but will eventually join the Homestead Trail at the Nebraska State Line. The Blue River Rail Trail was named by the Rails to Trails Conservancy as one of the top 10 trails for history.